Like the overwhelming waters of the ocean, the monsoon rains almost endlessly poured the whole day and evening during the celebration of World Oceans Day last June 8. Yet despite the wet weather, the overwhelming participation of school partners as well as the local government council poured in on the myriad of events prepared for this very special day. 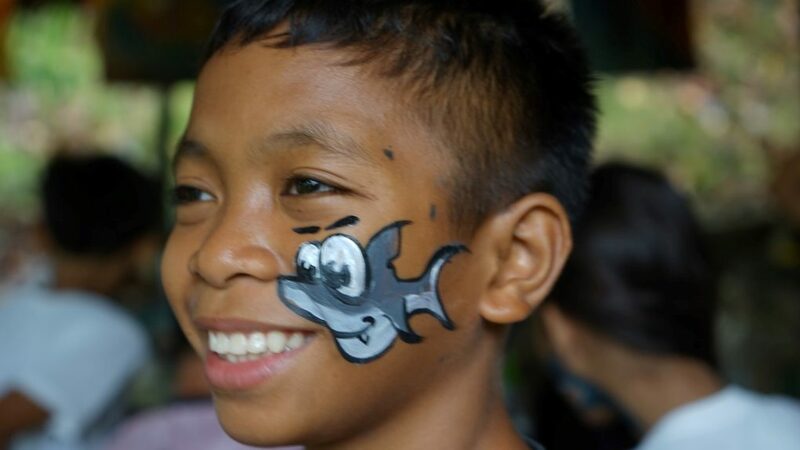 Almost a hundred Grade 6 pupils from two of Stairway’s neighboring schools flocked to Stairway compound that had been transformed into a kaleidoscope of marine elements and stations. Giant marine sculptures made up of plastic debris seemingly welcomed the kids as they entered the premises. It was indeed a day of fun learning and camaraderie as the kids went in to various posts to enjoy the ocean games and activities lined up for them: reef board games, face painting, anatomy of a polyp, reef presentations, trash sorting, jewelry-making through recycled papers and creation of small art works from trash. They may have missed the chance of swimming and snorkeling at the nearby beach because of the rainy weather but they got a glimpse of the wonders of the seas under through virtual reality cameras. “We are very thankful because we learned a lot and we hope we will be given another chance to do this again. We learned how to take care of the seas through the proper disposal of garbage. We saw the beauty of the works of God under the sea and we very thankful for this rare opportunity.”, remarked one pupil. 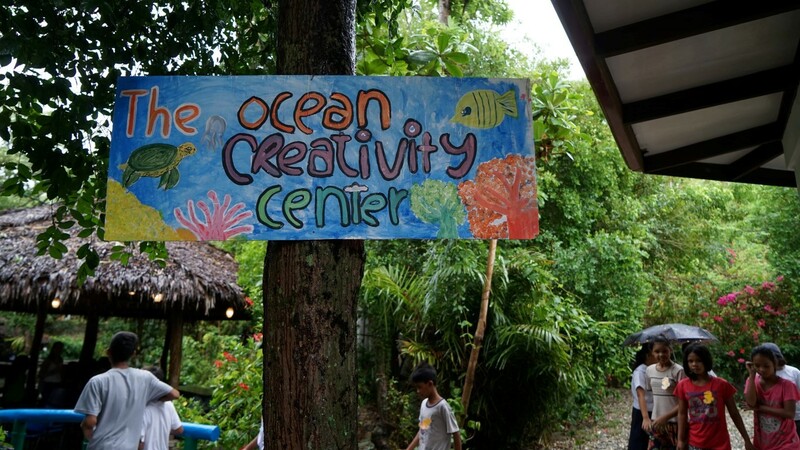 Taking inspiration from the U.S.-based “Washed Ashore” project that aims to bring awareness of the world’s growing problem of plastic pollution through art, Stairway invited its local partner schools in Puerto Galera in a competition to create marine sculptures out of plastic debris and trash. 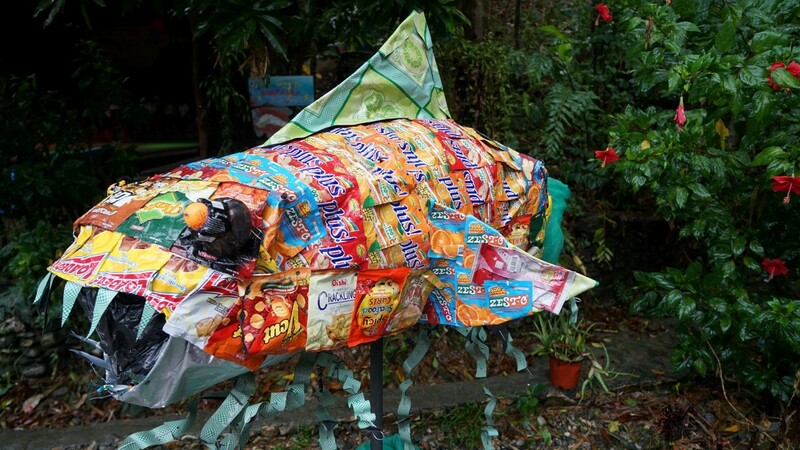 Along with the creation of marine art sculptures, the competition also encouraged the schools to conduct school and community activities that help raise awareness about plastic pollution like beach cleanups and film showing. Five high schools responded to the call and started creating their own sculptures from trash and plastics collected within their schools and in the community cleanups. Since February until June, the schools were able to reach to thousands of students and various groups in the community through the showing of documentary films like “A Plastic Ocean” and “Chasing Corals” along with community and beach cleanups and also mangrove planting. 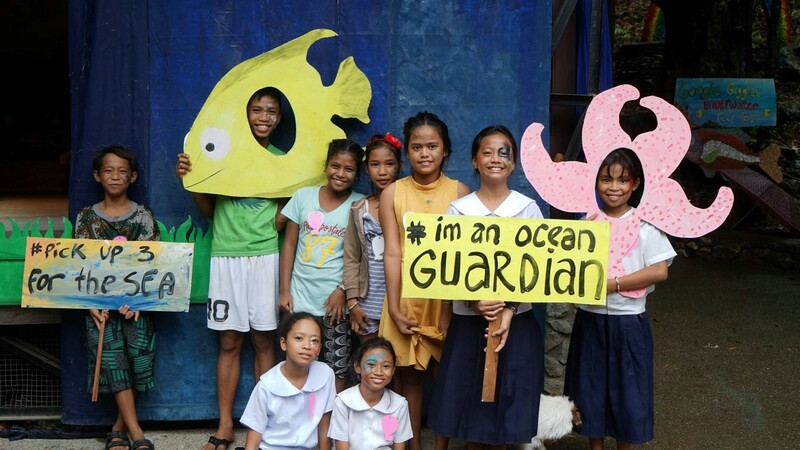 The schools’ entries –a giant sea horse, a conglomeration of dolphins, crabs and a sea turtle, a giant sea clam and a piranha– were gathered and exhibited at Stairway for the celebration of World Oceans Day. Three guests were invited as judges of the Marine Art Competition: Ms Nida Calmpong, a marine biologist and professor at Siliman University; Ms Maricel Montero, the executive director of the Manila-based art museum for children “Museo Pambata”; and Ms Judit Llavina, a Spanish educator specializing in “Design Thinking”. Despite the incessant rains, some 200 teachers and students from the five participating schools arrived at Stairway in the late afternoon to join the celebrations, witnessing the theater performance of Dr. Seuss’ The Lorax, the premiere showing of the ocean reality film “Blue” and of course, the announcement of the winners of the Sea Creature Plastic Waste Sculpture competition. All entries in to the competition were awarded with a cash price ranging from 12,000 to 3,000 pesos from winner to last. The cash prizes will be released upon submission of a plan on how to invest the money into environmental campaigns and projects within the respective schools. The World Oceans Day also became a good opportunity to collaborate with the recently elected officials in the barangay (village) where the Stairway center is situated. The officials, together with their youth council, health workers and auxiliary security earlier joined the Sea Adventure School and were immersed to the wonders of Puerto Galera’s mangrove, sea grass and coral ecosystems. After their session at the floating classroom, they later on decided to a conduct a cleanup along the premises of their beach that has long been a place where people litter after their picnics. After the cleanup, they have resolved to enforce stricter measures to address this issue as well as carry out intensified education campaign on proper solid waste management in their community. Another issue of the village is the community households’ trash that is thrown into the river that eventually goes to the sea. Most of the plastics and trash that get stuck in the coral reefs within the village beaches have been cleaned up by volunteer divers from Stairway’s EACY Dive School. 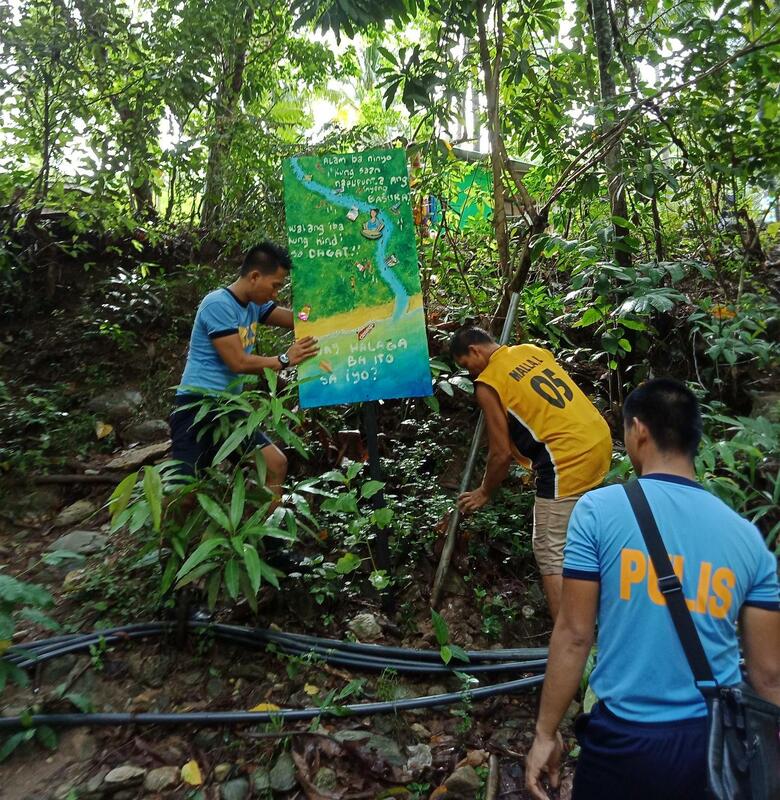 The morning after World Oceans Day, a big river cleanup was organized with participation of members of the EACY Club, the barangay council and the community-relations group of Philippine National Police. A total of 70 people were mobilized in the cleanup. After the cleanup, the young members of the EACY Club aired their opinions and suggestions to the newly-elected officials regarding the issue of littering within the villages. The children suggested the stricter implementation of national laws on solid waste management as well as the close coordination between EACY Club and the barangay council in the campaign. The village officials are now contemplating to protect its reefs against fishing and the entrance of jet skis and other touristic activities from nearby resorts that may disturb the reefs. This plan will be closely guided by the Municipal Fisheries Officer in accordance with national and local policies.